Sudduth Elementary librarian Leslie Hunt helped to bring a Makerspace to the school – an area filled with myriad materials that can help to inspire young minds to build, solve problems, and even get some learning in without them even realizing it. “I just started thinking, it would be awesome to have it all in one room for everyone to utilize,” Hunt said. “(The kids) love it with just being creative and it helps them with behavior issues. 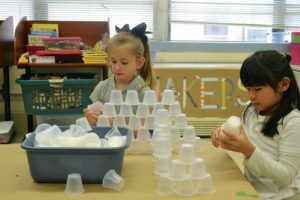 It is amazing (because) some of the kids … have had difficulty doing certain things, but in here it’s kind of like everyone is on the same level.” she also noted that students tend to get more creative and imaginative when using simpler materials such as plastic cups and unsharpened pencils.